This method will display your WordPress page in an iframe in the app. This type of page is perfect if you have interactive content such as a custom form that will not work through the WP-API. Custom plugin content also works great. Want to use the WP-API instead? Use an API list or custom page instead. Go to Menus => Add Item => WordPress/External Links. 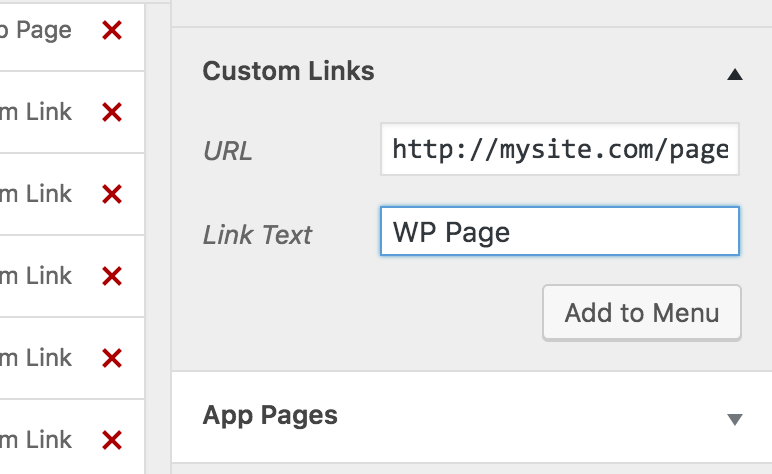 Enter the full url to the page you'd like to appear in your app, along with a page title, then click "Add to Menu." Save and refresh to see this page in the app preview. This type of page shows an iframe of the url you enter in the menu. The iframe will display the AppPresser theme and and any related code. You can also add an external link in this field, such as https://google.com. The page will open in a modal window on top of the app.